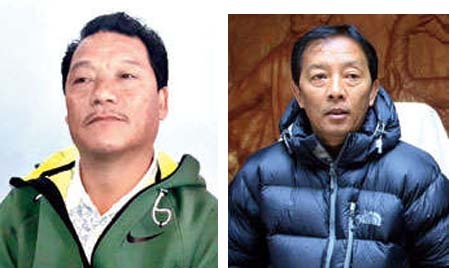 Darjeeling: Two presidents of the Gorkha Janmukti Morcha, who have expelled each other from the post and refused to acknowledge either's decisions, have wished the people of the hills in contrasting styles for the New Year. Binay Tamang, who heads the rebel camp and the Gorkhaland Territorial Administration (BTA), has stressed the need to be "more logical than emotional", and indicated that the statehood agitation and shutdown in the hills last year was "directionless." Bimal Gurung sought to focus on the "fight for our national identity." Tamang, who emailed his greetings to the media as GTA chief, called for a "positive mindset". "I appeal to our people, let us promise to work for our community with a positive mindset." "We have lost many years because of our traditional working style, emotional and one-sided thoughts and old mentality. Despite these many years, our community and our dreams are in peril," Tamang added. Tamang obliquely touched on the 104-day shutdown last year and termed it "directionless" and a result of "unplanned thoughts." "Due to directionless and unplanned thoughts and working style, we have suffered for long. Let us be united, not with narrow mindset and emotional thoughts but with openness and thoughts based on reality." Tamang stressed that the hill people should be "grounded in reality" rather than emotion. "For the true uplift of our community, let us move forward not with emotional thoughts but by working in reality." Gurung's message, which was posted by Roshan Giri on the party's WhatsApp group, dwelt on emotions, national identity and "long-standing aspirations". "I convey my best wishes on a new year to all the Indian Gorkhas who have always played an important role in this fight for our national identity." In his short message, Gurung described himself as a "guardian of the community". "Let there be new enthusiasm and happiness in your lives this New Year. Let our long-standing aspiration be solved. As a guardian of the community, I once again convey my best wishes." Two presidents of the Gorkha Janmukti Morcha, who have expelled each other from the post and refused to acknowledge either's decisions, have wished the people of the hills in contrasting styles for the New Year.